Leading agencies, brands and start-ups will be manning their stands to tell you about their companies and the opportunites available for you. You'll be able to chat directly with their employees and HR staff. There'll also be presentations inside the Big Top during the day from the likes of Milkround. If you're looking for a little more advice / help, take a look at the CV surgeries, Portfolio Reviews and Workshops, but remember, you need to sign up! Do I need to book in for a CV surgery session? Yes, there are two time slots available, the first (10.30am - 12.30pm) is for graduates looking for their first step into the digital world and runs, the second (2.30pm - 4.30pm) is for those who've taken that first step & are looking to move roles and moving up the careers ladder. How long do the CV surgery sessions last? Each person will have a 15 minute slot for their CV surgery session. A Portfolio Review is a one-to-one session with a senior creative from one of the UK's leading agencies to go through your portfolio with advice and how it could be improved. Do I have to book in for Hyper Island's Workshop, LETS MASH_UP? Yes. Hyper Island's Digital, Creativity & Education Workshop, LETS MASH_UP will be running twice through out the day, with the first session 11.30am - 12.15pm and the second 2.30pm - 3.15pm. Do I need to book in if I just want to come to the fair? You'll need to register here but once you're registered, you can come anytime between 10am - 5pm. Should I bring copies of my CV? Yes, we'd definitely recommend bringing along copies of your CV, have your number, Twitter and LinkedIn URLs to hand and perhaps bring along a tablet/ipad/laptop if you want to present something. If you're taking part in the CV surgeries - definitely bring at least one copy of your CV and maybe a laptop to make changes and/or notes. There's no need to wear a suit, but make yourself look presentable - first impressions count. Will there be food / drinks / refreshments? Yes, there will be water and juice available all day and tea/coffee on arrival. We'll have a mid-morning tea & coffee break around 11am, a lunch at around 12.30pm and an afternoon tea/coffee break at around 3.30pm. There are also plenty of passing bus routes, the best way to plan your journey is by using the TFL site. Where is the Big Top / Little Top? 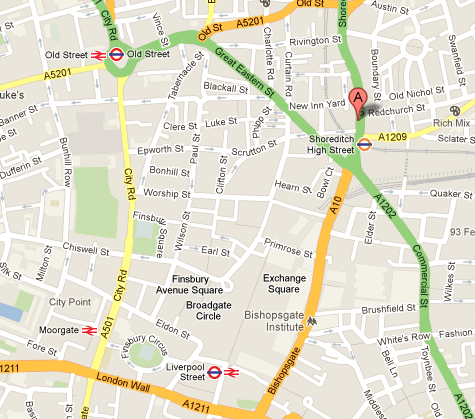 You'll find the Big Top at 186 Shoreditch High Street, right opposite the Tea Building. You can access the Little Top by walking through the Big Top - they'll be signs indicating where it's entrance is. Where is the TechCity Central Zone? The HyperIsland Workshops are taking place at the TechCity Central Zone. You won't have to leave the main venue and directions will be posted around the Big Top. Sorry if this hasn't helped. If your question remains unanswered, please do get in touch with us by help chinwag [dot] com (sending us an email).